Installation of the Rev. Dr. Teresa Hord Owens as General Minister and President of the Christian Church ((Disciples of Christ) on July 12, 2017 at the Indianapolis General Assembly. (picture taken by Don Dewey). This year the General Assembly theme focused on unity. Disciples have made unity our clarion call from the very beginning. In the words of Thomas Campbell, "That the Church of Christ upon earth is essentially, intentionally, and constitutionally one; consisting of all those in every place that profess their faith in Christ and obedience to him in all things according to the Scriptures." It must be confessed that while we have affirmed this premise, we have not always embodied its message. Our own movement has divided at least twice, if not more often. As my friend Jose Morales reminded us, true unity is not easy. It requires much of us. Jesus prayed in John 17 (theme text) that we would be one, even as he and the Father were one, so that the world might know that God had sent Jesus in the world: "I’m in them and you are in me so that they will be made perfectly one. Then the world will know that you sent me and that you have loved them just as you loved me" The question is, how do we measure unity? Disciples have traditionally eschewed theological debate. We accord each other much room theologically, and thus Disciples are all over the map theologically. I make Alexander Campbell, Trinitarian, others, like Barton Stone, are not. We have decided not to make this a test of fellowship. On matters of social justice, we find it more difficult to accord each other room. I'm not sure how we can, in many cases. On matters of race, gender, sexual orientation, there appears to be no third way.It is hard to agree to disagree when your own identity as a human being is at stake. On matters economic and political, where you would think there would be more room, sometimes there isn't. Perhaps that's why the business meetings are essentially one-sided, and a sermon can call out the voters for a particular presidential candidate and receive applause. 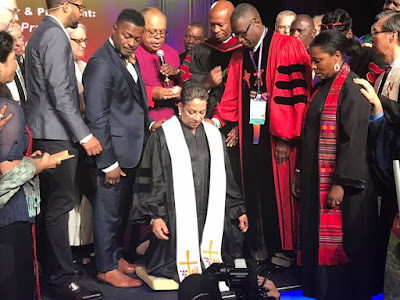 (I will say that while I might agree with much of what was said in the sermon, naming voters for Donald Trump probably wasn't the wisest thing to do--as it could be taken that we are an arm of the Democratic party). That being said, the highlight of the General Assembly has to be the election and installation of the Rev. Dr. Teresa Hord Owens as our new General Minister and President. Having had the privilege of being present at the historic election of Sharon Watkins as our General Minister and President in Portland in 2005, it was another privilege to be present at the election of Terri Hord Owens and then share in her installation. On both occasions I got to cast my vote, and I did so with great joy on both occasions. While Sharon broke one ceiling, Terri breaks another. Sharon was the first woman to lead a mainline denomination (though I like to point out that Aimee Semple McPherson founded a denomination back in the 1920s). 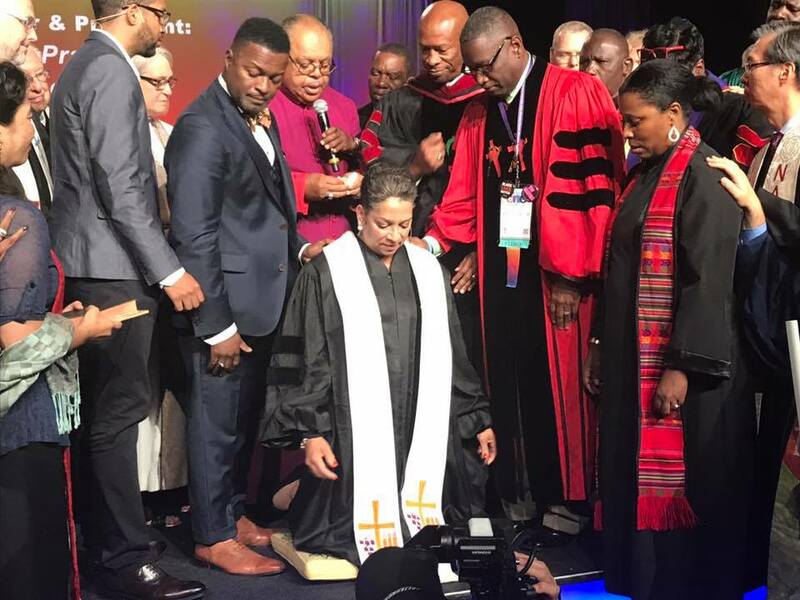 Now, Terri Hord Owens is the first African American woman to lead a mainline denomination. That is an important development for the Disciples as we remain a predominantly white denomination. After I have more time to re-watch her sermon, and perhaps read it, I will offer my thoughts on her opening message. What I heard gives me hope for the future. While she also spoke of the centrality of unity, she also spoke of grounding our work theologically and biblically. What she said was, let's do more than put down some bible texts in our resolutions, but actually engage in deep bible study in our communities. As a theologian and bible teacher (I believe pastors need to reclaim both of these offices for the church), I heartily agree! More will come in time, but, let me conclude with this: Terri Hord Owens reminded us that while she feels God's call to this position, she understands: "This is not a solo gig. This is the work of the whole church together." She called upon us to join #TeamDisciples. As a Disciples pastor, I accept the calling to be part of that team. I hope others will do the same! Thank you for this reflection. The election and installation of Dr. Owens will be a highlight for the highlight reel of this General Assembly for me, as well. Her call for us to be #TeamDisciples is one I happily accept. We can do more together than we can when we are pulled apart by anger, fear or hatred. Dr. Michael Kinnamon's word at the Disciples Peace Fellowship breakfast helped us move beyond the strangle-hold of FEAR...and is a challenge I hope many will also accept.